I am getting better at cutting the cake and serving the slices without everything getting messy. The trick to cut a fondant cake is to use a serrated knife. I wish I knew that when I started out or remembered to ask for one at a party an year back. I cut a circle (about the size of a bangle) in the middle of the cake using a knife, cutting vertically down all the way to the bottom.Kind of trying to make a donuts shape out of the cake, but not taking the cut middle portion out. Now that the middle is a separate ring, its easier to cut the outside donuts ring into equal slices. For a three layer cake, its a lot easier to go this route. For smaller cakes, I wouldn’t bother with all this. But even though I am comfortable with cutting the cake, I like it better when dessert is served out in portions. 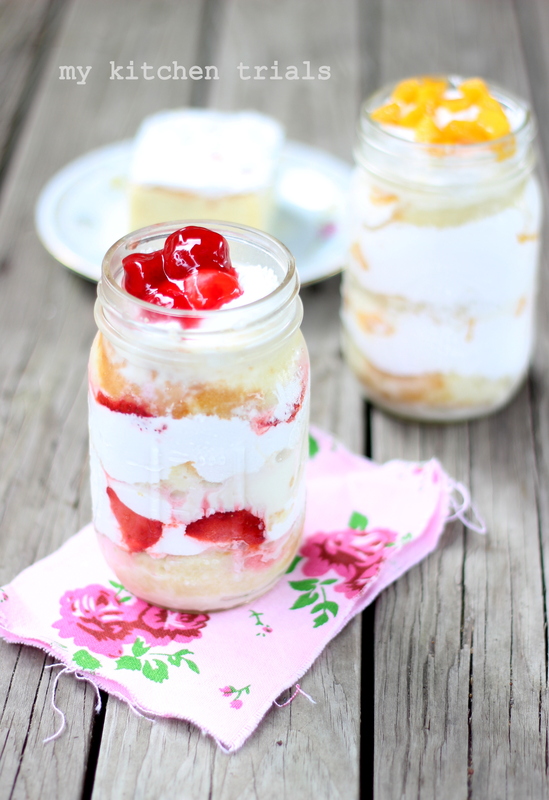 Like these mason jar layer cake here. Mind you, these are ‘couple portions’ as its too much for a single serving. Somehow I don’t mind that element of sharing at all. Read on about putting this cake together, the individual layers can be made over a couple of days if you are making them ahead. 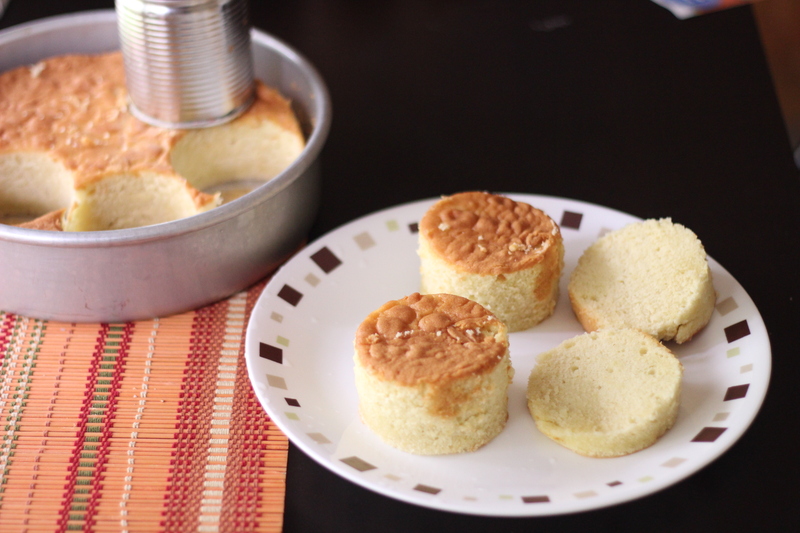 I pretty much bake only hot milk cake now whenever I need a yellow cake. But, any base cake would do. Cut the cake using a cutter that’s a little bit smaller than your bottle.I used the evaporated milk can as the cutter here.Cut each cake circle into two. I used three discs per mason jar. Prepare the tres leches syrup ( mix well 1 can condensed milk, 1 can evaporated milk and 1 cup heavy cream). Set aside. Using a stand mixer or hand mixer, whip 1 cup heavy cream with 2-3 tablespoons of powdered sugar until it holds peaks. The syrup and the whipped cream can be made a day or two ahead and refrigerated until the time of assembling. 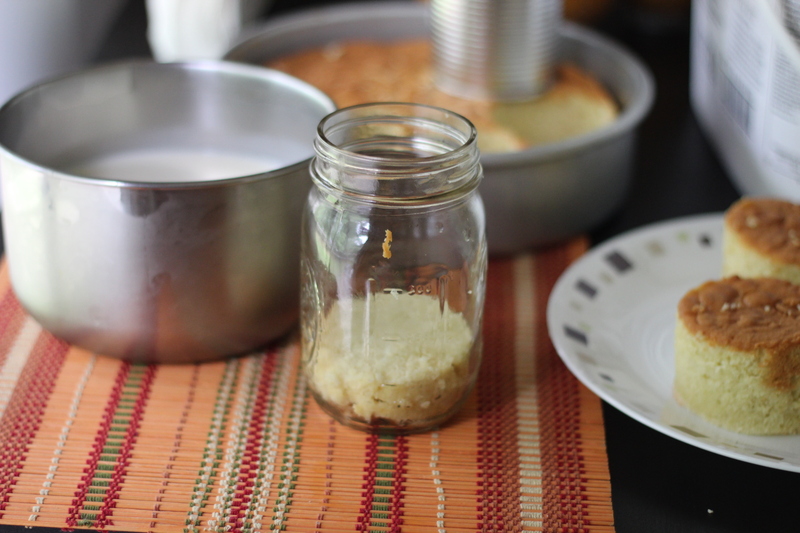 To assemble, carefully slide the cake circle inside the jar. Soak it generously with the syrup. Layer with whipped cream and chopped fruit, if desired. Repeat the layers again (cake, syrup, whipped cream, fruit) until the jar is full. Finish off with a layer of fresh cream and top it with fruits. Each bottle serves two. Its too heavy for single serving. Very tempting..Infact the tres leches syrup makes me drool. It must be quite delicious. Super yumm desert jar!! It is so handy to put together! Lovely share!! 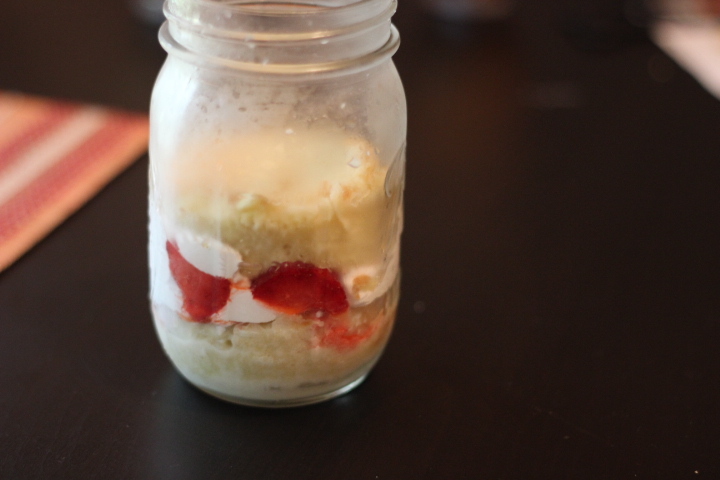 Brilliant idea of serving a dessert in a jar, lipsmacking here. This looks super inviting Rajani. I am yet to make this cake. Will try to make this for this month.. 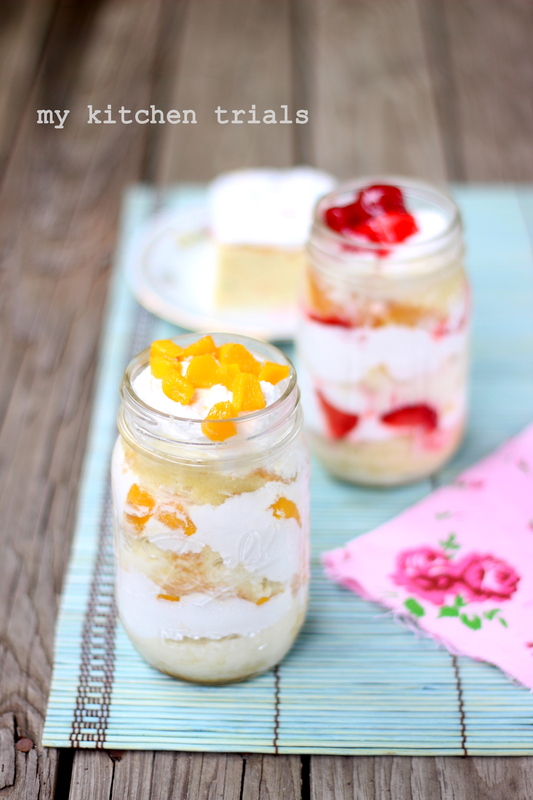 This looks super tempting and makes me drool..
That is an amazing cake in a jar. Tres leches cake is on my list for a long time but just the amount of calories is scaring me from making it at home. It’s super yummy just need a clarification,shd all ing ie condensed milk evaporated milk n heavy cream whipped together with sugar? Sorry about the delay in replying. The whipped cream with sugar is separate. For the syrup, it’s just mixing the 3 different milk components until it’s homogeneous. Sorry about the confusion, I will rephrase it soon. wow rajani, awesome yaar, love love the dessert!!! i still need practice cutting a cake, this dessert jar, will be a neat way to finish off a messily cut cake too, what say? I have never tried baking in major jars, So I really don’t know. You can try baking a sheet cake and then cutting out rounds using a cutter. There won’t be any wastage since even crumbled layers look beautiful here.